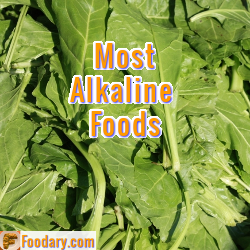 My most alkaline key foods list summarizes the top items from all my alkaline foods lists. Before you use the list below, you should read my Alkaline Food Lists Explanation, and some of the examples listed at the end of that explanation. The science behind a good alkaline diet might be complicated, but my lists make managing your own diet easier. In essence, for healthy eating, you need to allow around 20-25% of your calorie intake in acid forming foods, and the rest in alkaline forming foods. The lists guide you to make better choices when planning what to eat. However, the only true measure of the success is to measure urine pH, and set an alkaline target. I will explain more about setting and testing your alkaline target in other articles. In the meantime, use the list below to find the most alkaline foods that will increase your pH. There are around 100 foods in the Most Alkaline Key Foods List. I started with all the foods from the USDA key foods list. I ignored any that had more than 1000mg sodium per 100 calories. That is an arbitrary cut-off. It is total daily sodium that matters, and you will have your own personal daily allowance. Some of the high sodium foods that remain are probably best avoided. In particular, the tomato paste nutrition values show the massive distortion to diet caused by salt added to processed food. I have also omitted some slightly alkaline foods so that we can focus on the most useful improvements. The key foods are selected by USDA for their popularity with the entire population. As time passes, I will add more foods based on popularity with Foodary visitors. You can influence that process by discussing your favorite food and drink in the Foodary Healthy Eating Forum. The alkaline foods list below starts by listing all important alkalizing foods in PRAL-score sequence. You can change sequence by clicking any column heading, and clicking it twice will reverse the sequence. Of particular use on longer lists, is the search box immediately above the table. As you type any letters or numbers, the list is filtered to items that just contain your text. Eg, type tom in the search box to see what I mean by tomato paste. Though you cannot create a truly healthy eating plan just from this list of most alkaline key foods, it is a terrific resource for healthier eating. Now, you can improve slowly by gradually introducing top alkaline foods into your diet. As you find those you particularly like, you can start new ways to improve your diet. I often advise that you start meal planning with your favorite protein food, then add more alkaline foods to end up with a meal that is alkaline in total. So, you might choose a 200 calorie portion of beef, then select 400 calories from suitable foods in the list above to produce a tasty, nutritious meal. How soon will it be before you start your meal planning with this alkaline foods list? Choose 400 calories from the list above then select 200 calories of protein to complete the meal. Or start with spinach, and search for spinach based meals that satisfy your appetite and your nutritional needs. What creative ways can you think of to get the most from top alkaline foods? If you have any questions, experiences, or opinions about this Most Alkaline Foods List, please join the most alkaline key foods list discussion.